Everyone I know has been to a salt room except me, and I'm a lil' bit salty about it. Sure I get a fair dose of salt in my life: a sprinkle on my eggs, a pinch on my tomatoes, a handful on pretty much everything else... 😂 . (I'm totally bound to have high blood pressure.) But apparently society thinks you can't get enough of it. Hence the latest detox trend: napping in a room filled with this Himalayan goodness. After I handed my waiver back to Garrett, he walked me over to a set of lockers where I would keep my purse, shoes, and cellphone. (That's right, no electronics allowed 😒 ). Equipped with only my socks and my curiosity, he led me into the colorful salt room, where two other guests were already lounging. I tiptoed across the pit of pink Himalayan salt and settled into one of the heavenly reclining chairs. Garrett briefly introduced himself to us and gave us a quick spiel about the benefits of salt (...other than it pairs well with watermelon). Then he politely excused himself and wished us a peaceful 45 min nap. Besides feeling like I just caught up on three night's rest, I noticed that another tiny miracle had just taken place: I walked into the room with an agonizingly achy sore throat and I walked out with a mildly achy sore throat! 45 minutes of nap time in exchange for cured cold? Is this too good to be true? Well turns out my positive results weren't just some sort of placebo effect, because Himalayan salt happens to be one of nature's strongest healers. 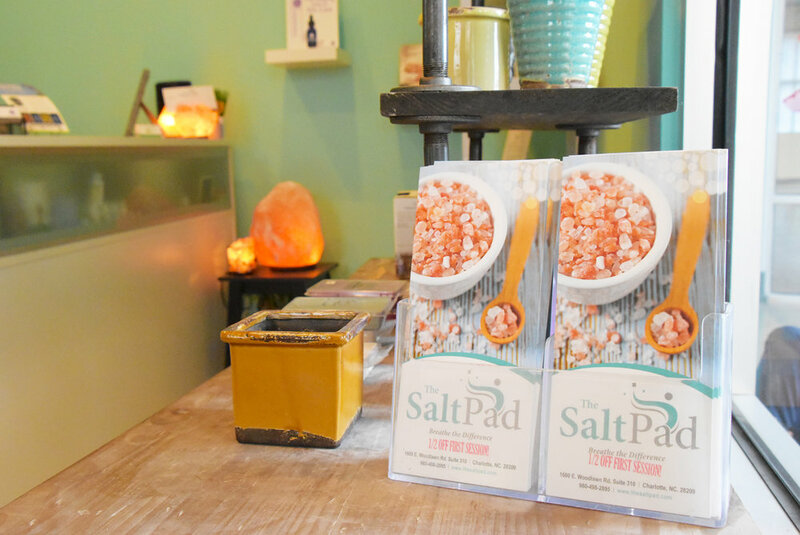 The salt used in halotherapy is naturally anti-inflammatory, antibacterial, antiviral, anti-fungal, and antimicrobial. Meaning, it does a killer job of reducing inflammation in our respiratory systems and strengthening our immune systems. That's why it's ideal for anyone who struggles with allergies, asthma, sinusitis, eczema, or psoriasis. I never had acupuncture before so I wasn't quite sure what I just agreed to. First, I laid face-down on the massage table, then Garrett began sticking super fine needles into my trouble spots. I honestly felt nothing more than a slight tingle when he put them in, which was totally opposite of the grueling pain I expected. Then once all of the needles were in place, Garrett dimmed the lights and left the room for 25 minutes. Since ya'll now know how bad I am at doing nothing, it should come as no surprise that I immediately tried to wiggle around and check out my new cactus back as soon as he shut the door. Bad move. Because just as I lifted my right arm to feel my porcupines, a sharp pain jolted up my back. I froze in fear for what I had just done, then slowly eased my way back into my starting position. For the remainder of the session, I didn't even lift a finger. When Garrett finally came back in and removed the needles, I hastily squirmed around to make sure all my limbs were in working order. And then he finished the session with some bodywork, which is essentially a tough-love massage. As if I needed my salt obsession to get any worse, now it's reached new heights. I've bought an at-home salt lamp, I've doubled my sodium intake, and I'm going to make it a point to get a Salt Pad sesh in at least a few times a month.